Our all-welded extreme duty steel cabinets are the smart way to store equipment. We manufacture only from 12 gauge steel, these cabinets have all the features to last a lifetime. The all-weld design is what we build to be a true survivor in today’s rough and rugged manufacturing environment. The features of these cabinets include adjustable 14 gauge shelves with up to 1,900 lbs. capacity per shelf. Which can adjust in 2 inch increments. The shelves are 21.5 inches deep. You can always add more shelves for versatility. It also has drawers that have the capacity of 400 lbs per drawer. The 3-point locking device includes a hasp built into the handle for use with a padlock. The 6 inch tall 7 gauge legs are weld to provide mobility in lifting in order to move from one area to another. These heavy duty 12 gauge steel floor model cabinets provide protection for valuable tools and machine parts. We build these Extreme Duty Steel Cabinets for rough and tough industrial use. These cabinets are 20″ or 24 inch deep x 72 inches high with an overall height of 78 inches to provide the storage without taking up too much of your valuable shop floor. Our 36″ Deep heavy duty 12 gauge BATTLESHIP industrial storage cabinet include adjustable 14 gauge shelves with up to 1,900 lbs. capacity per shelf, which can be adjusted in 2 inch increments. Doors have a 3-point locking device includes a hasp built into the handle for use with a padlock. We also offer a digital, keycard, and barrel locking options for increased security measures for this unit. Also, these extreme duty steel cabinets provide protection for valuable tools and machine parts. Our standard all-weld, wrap around body construction, industrial storage cabinets we build for rough and tough industrial use. Cabinets compare to no one when put to the test of the strongest industrial storage solutions available. Cabinets ship fully assembled and ready for use. Floor model cabinets provide protection for valuable tools and machine parts. We build these cabinets for rough and tough industrial use. Our 30 and 36 inches deep cabinets provide the extra storage space for the time when you just need a lot of room in your cabinet. It is 36 inches deep to store those really big tools and items that just don’t fit into a standard cabinet. This is extra deep to allow some of those long items to fit easily inside. These cabinets have to all-welded wrap around body that is standard with most of our cabinets. Also, if this cabinet is not deep enough, just ask us to build something deeper. We can custom build to your specifications. We can make the cabinets wider, deeper, or taller to fit your needs. Of course, we can always make your cabinets any size if you need them a little smaller too. We can make these narrower, shallower and shorter to meet your ever-changing needs. Other features of these cabinets include adjustable 14 gauge shelves with up to 1,900 lbs. capacity per shelf, and can be adjusted in 2 inch increments. There are 3 shelves in the 5 foot tall models and 4 shelves in the 6 foot tall models. The shelves are 27 1/2 inches deep. You can always add more shelves for versatility. The 3-point locking device includes a hasp built into the handle for use with a padlock. The 6 inch tall 7 gauge legs are weld to provide mobility in lifting in order to move from one area to another. These all-welded extra heavy duty “BATTLE-SHIP” constructed storage cabinets are the smart way to store equipment. We manufacture it from 12 gauge steel, these cabinets have all the features to last a lifetime. We use the all-welded design for today’s rough and rugged manufacturing environment. Standard color is Gray, many other colors to choose from at a small up-charge for any quantity at one time………… StandardShelving.com BIN DIVIDER UNITS STRONG ENOUGH TO LAST, FOR YOU TO PUT TO USE. Contact us! When you need durable, convenient storage for small parts or supplies do what so many other facilities have done. You can find these storage centers everywhere… service areas, parts departments, tool rooms, shipping rooms, warehouses, and assembly areas. The units provide easy and free access to all components. Also allow quick visual inspection of their contents. Steel bin shelving is what you need. Sturdy 22 gauge steel box shelves are reinforced by dividers that feature safety hemmed or beaded edges to avoid injury during retrieval of the bin contents. Rugged 14 gauge upright posts, punched on 1″ or 1-1/2″ centers. They support a heavy load of small parts. Move the dividers, add to or remove at any time to accommodate changing storage needs. We’ll make sure you’re satisfied. Closed back and side panels keep the contents where they belong: on the shelf. Furthermore, they provide additional rigidity, durability and security to the bin units. Furthermore use Bin divider modules individually or in continuous configurations. Work with us! Select from popular standard styles and sizes or have Standard-Direct.com custom design units to meet your very specific needs. So have any questions? Or would like a quote on one of our safety cabinets? Please call 1-800-622-2692 to speak with one of our experts. All-Purpose cabinets and bin storage cabinets provide secure storage for your valuable parts and tools. Standard performance features such as ships completely assembled. Ready to use. And finally, 14 gauge all-welded construction. Our 36″ wide to 72″ super-wide, colossal cabinets allowing for maximum and efficient storage while providing superior strength and security. Ships completely assembled. Ready to use. Some of our shelves are pictured below. Check our or 267 bin cabinet. Industrial grade steel cabinets from StandardShelving.com offer secure dust-free storage for a wide variety of uses. So you can maximize your storage efficiency by using steel cabinets. Also these can be paired with Akro Bins, Akro Drawers, or TiltView tilting bins. Bin Cabinets are full-size floor cabinets featuring louvered back panels for hanging a variety of bins. Some cabinets also include louvered doors or shelves for more storage options. Also Extra Heavy Duty Storage Cabinets and Bin Cabinets. All welded 12 gauge or 14 gauge steel construction. Secure 3-point locking system with pad-lockable lever handle for added strength and security. In addition doors open 180 degrees for full access. Also includes 12 or 14 gauge reinforced shelves with 2″ lips and welded corners. Check it out today! We have a lot to offer. In addition shelves have up to 2000 lb. capacity per shelf and adjust at 2-1/2″ increments. Available with 4″ high legs with bolt holes to secure to floor. Powder coat finish. Choice of Storage Cabinet Colors: Gray, Blue, Black, Red, Yellow, Putty & Green. All welded steel storage cabinets are Shipped set-up. Ready to use. We also offer top brands such as Durham, Jamco, Akro-Mils and Quantum bin cabinets. Bin cabinet storage provides you with superior organization. These are great for your industrial warehouse, garage, or facility. Bin cabinets are just what you need. Especially if you are storing many small or medium sized parts and want a bit more organization or security. We carry top bin cabinet brands. Like: Akro Mils, Hodge, Lyon, Penco, and Edsal. We at StandardShelving.com are sure to have the bin cabinet configuration you need. These include 12 GA steel, 14 GA steel, and welded. So please order today! Steel Cabinets are available in a variety of sizes. They range from 36″ to 72″ wide. You can purchase these steel cabinets with or without plastic bins. Bin Cabinets are perfect for any environment. Finally, you can choose from cabinets that have the plastic bins hanging on the doors or units that just have the bins on the cabinet’s shelves. If you have any questions feel free to contact us! Leave a comment as well. virtually every strength requirement for heavy manufacturing, assembly and maintenance type work. Rock solid heavy duty shop tables and welders workbenches. These Heavy Duty Welding tables offer 1/4″, 3/8″, 1/2″, 3/4″, and 1″ plate steel tops. Each table offers all-welded construction and is built to 36″ overall working height. The unpainted top is ideal for welding applications. Each table is uses 4 x 4″ 11 gauge legs and features a bottom shelf with wire decking. All tables are painted with Black Gloss primer paint. Powder coated paint finish available..Our tables meet virtually every strength requirement for heavy manufacturing, assembly and maintenance type work. The top is PLATE-STEEL and the legs are heavy duty 11-gauge 4″x 4″ tubing. VENTED Wire-Deck bottom shelf for storage. Tables greater than 8 feet in length have 6 legs. These table have a capacity of up to 20,000 lbs. These tables are available with drawers. As always, we can customize benches to include more drawers, less drawers or different size drawers. All our tables are available for you to customize…. If you are searching for a solid heavy duty shop table, look no further. Our EXTREME Heavy Duty Welding & shop tables offer 1/4″thick, 3/8″thick, 1/2″thick, 3/4″thick, and 1″thick plate steel tops. Each table is all-weld construction and is to 36″ overall working height. Also, the unpainted top is ideal for welding applications. Each table uses 11 gauge 4″x 4″ legs and a bottom wire grid deck lower shelf. All tables are colored with Black Gloss primer paint. Furthermore other powder coated paint finishes are available……. Welding Benches like all work benches need to be built solid and be well anchored if needed. Due to their weight these are a great place to attach a vise. Though a vise can be an obstruction to using the bench for building things as large as or larger than the bench. Try mounting the vise on a leg so that the jaws are no higher than the top of the bench. If you mount this way on a leg it can still work for sawing off the side of the bench but not interfere with work on the bench top. Vises mounted on weld platens should be attach with pegs and wedges so they are easy to install and remove. Steel Drawer Cabinets. Built for industrial use, this cabinet features all welded drawer construction of prime cold rolled steel. Steel Drawer Cabinets drawers also include full width handle. Positive stops to prevent spilling. Each drawer is has a slot on 1″ centers to accept steel dividers. Ships assembled. Color: Gray standard (custom colors available Small parts storage for industrial shops & tool rooms. We have 36 Drawer cabinets, We have 48 Drawer cabinets, We have 60 Drawer cabinets, We have 72 Drawer cabinets……. Small parts storage systems, welded steel drawers provide easy access to the smallest parts. Drawers have built in handles and label holders for ease of use. Finished in gray with 7 other colors available. Also, steel shelf drawer come in depths of 12″, 18″, and 24″. Each drawer can divide into compartments as small as 1″. Parts drawer cabinets are designed for dense and frequently picked products such as fasteners, automotive or replacement parts. Removable drawers have a smooth slide in and out design. In addition, gray steel cabinets have powder coating and built to last. Furthermore, drawers and dividers are available separately too. DRAWER CABINETS: All metal welded steel drawers are available in 5.5″ , 8.25″ and 11″ widths. These steel drawers are for storing a variety of small parts. Drawers are rugged metal and slide smoothly evenly on steel shelves. In addition drawer units are nut and bolt construction and are shipped set-up ready to use. Made in USA. So these high density Drawer Cabinets allow the storage of large quantities of smaller parts in less space. Because of this they are perfect for storing and organizing all types of parts. In addition prime cold rolled steel construction drawers mounted in a setup closed steel shelving unit.. Consequently, high density drawer cabinet; stores large quantities of small parts. Drawers feature welded design for superior strength. Drawers have full width handles and easy glide runners. Because each drawer has slots for dividers, which are adjustable on 1″ centers.…….These high density Drawer Cabinets allow the storage of large quantities of smaller parts in less space. So they are perfect for storing and organizing all types of parts. In addition, they can be set on a work surface, and inserted in standard 36″ shelving or set on the floor. Also some of our cabinets can easily stack using embossed mounting holes. Small parts storage systems, drawers and bins provide easy access to the smallest parts. These storage cabinets are ideal for fasteners, nuts, bolts, nails, artifacts, small plastic parts, computer parts, and all types of hardware. Sent to you no assembly required. FLAMMABLE LIQUID STORAGE CABINETS are for containing flammable materials. Our lockable flammable storage safety cabinets welded and are the perfect solution for storing flammables. Heavy duty double wall steel construction with adjustable shelves. Deep leak proof sill sump. Safely contains hazardous chemicals and flammables, reducing the risk of fire and injury. Improved security with recessed lockable paddle latch and 3 point locking system. 2″ Bunged air vents with flame arrestors on each side of the cabinet allows for ventilation. Safety yellow or red powder coat finish (other colors are available). Standard 2-door manual close or self close design. Shelves also contain a double wall 18 gauge welded steel construction with 1-1/2″ air space. Dual 2″ capped vents with flash arrestors for external exhaust. 2″ high leakproof door sill contains spills. Adjustable leveling feet. Locking handle with 3-point latch. Cabinets may include 500 lb. capacity galvanized shelves, adjustable on 2-1/2″ centers. OSHA regulations are very strict regarding the storage of flammable and combustible liquids in order to protect public safety. So, if you are looking for a flammable liquid storage safety cabinet it’s important to make sure that the safety cabinets or unit you purchase meets OSHA requirements. Construction meets NFPA Code 30 and OSHA Standard 1910.106 for storage of Class I, II and III liquids. Factory Mutual Approved. Regulation: 60 gallons for Class I and Class II liquids and 120 gallons for Class III liquids. Explanation: Overfilling flammable safety cabinets can pose a serious fire hazard because it increases the risk that containers could fall out when doors open, causing spills and releasing dangerous vapors. Additionally, some cabinets have specially designs with ventilation features, which could obstruct and close if cabinets are over capacity. Regulation: Internal temperature cannot exceed 325⁰F during a standardized 10 minute fire test. Explanation:This regulation ensures that if a fire breaks out in the area where the flammable safety cabinets is where the liquids inside will not ignite before firefighters can respond to the emergency. Most flammable and combustible liquids have an auto-ignition temperature of 500⁰F or more, which means that at temperatures exceeding 500⁰F the vapors from flammable and combustible liquids can ignite without an ignition source. Setting the regulation standard at 325⁰F ensures that auto-ignition will not be happen within the acceptable emergency response time of less than 10 minutes. Regulation: Must be labeled “Flammable – Keep Fire Away”. Explanation: As a matter of public safety, obvious and consistent messaging must be used to identify the cabinet. This is so that all fires (such as cigarettes, sparklers, portable grills, acetylene torches, etc.) are kept away from the flammable and combustible liquids contained inside. Regulation: Bottom, top, door, and sides must be at least 18 gauge (1mm) sheet metal and double-wall with at least 1.5 inches of air space. Explanation:The 18 gauge specification ensures that the cabinet will be strong enough to support the weight of the containers of liquids inside. Specific metals are not in the list because some metals are more reactive than others. So flexibility on metal composite within the regulations allows for customization on which materials will be kept inside the cabinet. But regardless of whatever metal the cabinets made of, the double-wall specification the liquids inside get insultion against the heat. This air barrier acts as insulation in the same way that a thermos can keep hot or cold liquids inside at the proper temperature. It does this by containing them in a smaller unit molded inside a larger outer unit. Regulation: Doors must have a 3 point lock and be at least 2 inches above the bottom of the cabinet.Explanation: A three-point lock ensures that the door or doors will close tightly, securing liquids safely inside. Raising the door off the bottom of the cabinet helps to safeguard against spills. This makes it likely that any liquid spillage inside is contained within the unit. While not required by OSHA, a highly beneficial feature to have on your flammable liquid storage cabinet is self-closing doors. Storage units outfitted with a fuseable link that melts at 160⁰F. When this happens, is also causes the door closing mechanism to release and close doors automatically in a fire situation.For a full listing of all indoor and outdoor storage requirements please visit OSHA’s official page. Have any questions? Or would like a quote on one of our saftey cabinets? Please call 1-800-622-2692 to speak with one of our experts. Any distribution center, a core component of a business, requires comprehensive planning to ensure supply chain management is effective and return on investment is high. If implemented correctly, pallet racking systems aid in efficiently storing materials and make a constructive impact on the logistics of your business. Answering three simple questions and understanding the core components of a pallet rack is the key to successfully choosing the right pallet rack system for your business. What are the needs of your business? Identifying which scenario your business correctly fits in ensures that you pick a pallet rack system with the correct capacity for your business. Determining Pallet Racking: What are the dimensions of your warehouse? Consider the dimensions of your warehouse or office space before deciding which pallet rack to purchase. The number of pallet racks and the size of the pallets will be determined based on your needs and the dimensions of your warehouse. Also be certain that you make room for the turning radius of your forklift when you plan your aisles. What type of lift truck will you be using? The length of the pallet rack beam depends on the type of lift truck that you are using. Therefore, when using a counter balanced pallet truck consider the maximum width of the pallet or load (whichever is larger) and the number of loads between upright frames before picking the length of the pallet racking beam. If you decide to use an outrigger or straddle pallet truck consider the maximum width of outriggers. Also load and the number of loads across while deciding on a pallet racking beam. Other important factors to consider when choosing a pallet rack are the pallet racking beam capacity, the depth of the pallet rack frame, the length of the pallet rack row spacers, and the frame upright height. As a result following these steps below will help you understand how to determine these vital measurements. Pallet rack beams provide crucial support and keep the pallets from bowing. You can figure out the required pallet rack beam capacity by taking the number of pallets multiplied by load weight. The beam capacity tells you the type of pallet rack beam that you need to purchase. For one level pallet racks, decrease beam capacity by 15% to account for the reduced end fixity. Also, use only heavier beams: which have four hook end connectors. The pallet rack frame is another crucial element in any pallet rack system. The pallet rack frame depth should be 6” less than the pallet stringer dimension. The frame depth must be in 3” increments. You may also calculate the depth of the pallet rack by adding 2 to 5 inches to the width of the product it will be holding. Pallet rack row spacers are used to connect pallet racks back to back. They increase stability and safety by maintaining consistent spacing between pallet rack rows. Consequently, Finding the correct length is the key to successfully utilizing these row spacers. Finally, the suggested pallet rack row spacer length is double the amount of pallet or load overhang plus 6” of clearance. Calculate the frame upright height by starting at floor level and adding the height of pallet and load to the height of the beam. In addition don’t forget to add the necessary distance of clearance between top of load and bottom of beam. The thickness of the support beam must also be added. Multiply the total number by the number of shelf levels to get the frame height. If you have questions about your pallet rack system needs or would like a quote on one of our pallet racks please call 1-800-622-2692 to speak with one of our experts. These shelf carts and our shelving trucks work great when used in factory, warehouses, storerooms and distribution centers. Multi-level shelf trucks are perfect for distributing production components to assembly lines or workstations. Rolls loads of parts, supplies, cartons, packages right to the job site. Steel Tray Shelf Trucks and carts are a great way to transport goods and material in an economical way. Available in a variety of styles, sizes and popular configurations. Shelf trucks have been engineered to support heavy loads with complete ease. Most carts the shelves are reversible so they may also be used as flat surfaces. Choice of open type trucks with visibility on all four sides or closed on three sides to secure goods from falling out. Another great feature is that trucks are available with BIN-DIVIDERS to partition shelves into smaller compartments and helps keep contents organized for ready retrieval. So you can add dividers or remove dividers at any time. Add extra shelves at anytime. Heavy 18 and 20 gauge steel shelf construction. Supports evenly distributed loads up to 1000 Lbs. per truck. All carts and trucks come with convenient push handle for increased maneuverability. Shelf Trucks come shipped knocked-down and ready to assemble and easy to set-up. Steel shelves are fully adjustable. Variety of standard sizes and custom configurations are also available. Shelves are available “FLUSH” or with with 2.25″ LIP helps prevent stock from falling during transport. Also convenient push handle allows for hand comfort. Heavy duty 5″ casters are standard. Standard colors in a high quality powder coat finish. The standard color: grey, but we have many other custom colors, Red, Blue, Tan, White and Black. If you have questions about your shelf truck needs or would like a quote on one of our shelf trucks please call 1-800-622-2692 to speak with one of our experts. StandardShelving.com dedicates itself to providing companies with innovative ideas and solutions for all their storage requirements. Standard Shelving manufactures a wide range of shelving, and can help you find the best steel shelving to use. Also manufactured is rivet rack shelving, shelf carts and much more. From the smallest of jobs to the largest ones, our production, warehousing, shipping, and customer service departments will ensure that your order arrives on time. All StandardShelving.com products are being manufactured with the highest quality standard of the material handling industry. Types of steel used include: 12 gauge steel, 14 gauge steel, 16 gauge steel, 18 gauge steel, 20 gauge steel and 22 gauge steel materials. Our Steel Shelving Systems include Open steel shelving and closed steel shelving with sides and back. Our industrial, warehouse, and commercial shelving units are being manufactured in the USA. Standard Shelving makes heavy duty and light duty storage systems. So these are manufactured from cold rolled steel for high strength and durability. Our standard Open shelf units use sway bracing on sides and back. The closed shelf units use backs and sides to enclose the shelving. Another thing, Standard Shelving has over 30 different standard sizes. Another special thing is custom shelf sizes. In addition steel shelving colors include standard gray with optional colors mist gray, dove grey, sand, blue, tan, putty, green, orange, red, black and sky white powder coat finish. Steel shelving is one of the most durable types of shelving, so you know it is going to last. As a result, all of our steel shelving is easy to assemble. Adjustable steel shelves are now available with nuts and bolts or with clips for quick and easy shelf adjustment. Our premium Boxer Shelf has all 4 corners lapped and welded for additional strength. Upright posts sizes vary from 3ft high to 16ft high for custom applications. In conclusion, if it’s heavy duty warehouse shelving, auto parts storage shelving systems, or office shelving, you’ll find it here. Leave a comment if you have any questions! We will be sure to answer them. Mobile storage carts are useful in a variety of industries and trades. 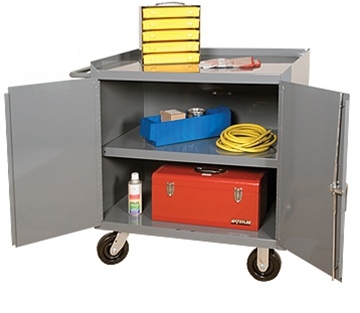 Whether you need a mobile place to store files or are frequently transporting tools, a mobile bench cabinet can be incredibly useful. This article will help you decide what to look for in a mobile tool cabinet or work bench so that you find exactly what you’re looking for. When considering the various attributes, it’s important to keep one thing in mind: what you will actually be storing. This will dictate a great deal of the storage attributes you will want in a mobile storage cabinet. Capacity should be one of the fundamental attributes you consider when selecting a mobile storage cabinet. This includes both the load capacity as well as the physical capacity. The load capacity tells you just how much weight the cabinet can withstand. This accounts for weight in the cabinet as well as on the surface. Consider what you will be putting in or on the cabinet and determine if you will need to determine what weight capacity you will be demanding. Don’t forget to consider the physical space you need. Will everything you want to put in the cabinet fit within the space. Keep in mind that generally over time, things will be added to this space. Consider the arrangement of the space as well. Do you want a cabinet with drawers, compartments or just a few shelves? One of the most important aspects is inside and outside length, width and height of the mobile storage cabinet you are considering. Again, you want everything to fit in the cabinet, but you also want the cabinet to fit in the space you have. Intuitively, larger mobile cabinets tend to be heavier while smaller ones are lighter. Height is also important, because it demonstrates whether you will be able to rest things on top. Counter height storage allows for things to be stored on top, while a taller cabinet does not. It’s important to decide if security is important for what you are storing. If it is, you will want a closed cabinet with a lock. If you want people to see and reach items within the store space, we recommend an open cabinet. You can also opt for a storage container with a glass or clear door that allows people to see inside while still containing the items. If you truly want open storage, we would also recommend a mobile instrument. The construction of the storage cabinet is hugely important when determining the hardiness of the storage cabinet. Stainless steel cabinets will last longer and are less prone to rust, stain or corrode. This higher quality metal will also keep the storage container looking better for longer. When you’re ready to select a mobile storage cabinet, we recommend buying from a name you can trust and a selection you can be picky with. Standard Shelving is the leader in industrial shelving storage and can help you make the right decision.